Discover Mont Blanc with this indepth Guide from Alps Magic. Mont Blanc is the highest and most iconic point in Western Europe. For some the name may be familiar but the mountain itself just a remote rock, massive but distant, in a corner of France. For hardier adventurers of course it is a target destination and there are plenty more making a living taking people to the summit every season. Find out everything you could possibly need to know about Mont Blanc (the French side). To get to Mont Blanc most people will travel to Chamonix, France, however the mountain can be accessed via the Italian side and lower parts of the ‘Mont Blanc Massif’ are in Switzerland. As Chamonix is located virtually in the centre of Europe getting there can be straightforward by car. Flying into Geneva is a very popular option and there are various mini bus type transfer services between Geneva and Chamonix which normally take just over an hour. If you prefer, there is a local bus service which runs from the Gare Routere in Geneva or from Geneva Airport, which takes around two hours. Of course there are also various car hire vendors at Geneva Airport or in town. It is also possible to get the Eurostar or TGV from Paris and enter the Chamonix Valley by rail via Saint Gervais Les Bains. Connecting trains take you on to Chamonix. Although comfortable and completely possible getting to Mont Blanc by rail is going to be the slower way when compared with going to Geneva and taking some kind of transfer. From the Italian side there are buses to Chamonix from Courmayeur, and coming from France you can also get a bus from Lyon to Chamonix. 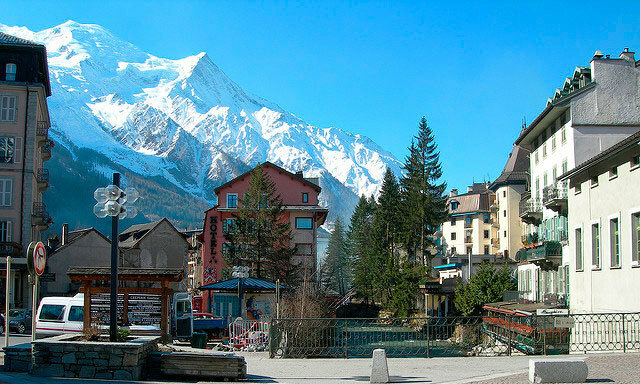 Select and buy bus tickets between Lyon and Chamonix. Modern mountaineering was born when on the 8th August 1786 when Jacques Balmat and Michel Paccard became the first men to reach the summit of Mont Blanc. They also won a reward for their trouble, which had been offered by a local scientist. Exactly one year later a tourist from the UK a Colonel Mark Beafoy also reached the summit and Chamonix’s reputation as a popular adventure tourist destination began. It was also soon to be the host of various winter skiing competitions. In 1946 work on the Mont Blanc tunnel commenced - linking France and Italy by road and was finally completed in 1965. Remarkably In 1950 and 1966 separate Air India flights crashed into Mont Blanc and pieces of the wreckage are still sometimes found traveling through the glaciers all these years later. The planes had been bound for Geneva but the pilots made serious errors in their navigation. Mainly due to Mont Blanc, Chamonix has become the world capital of mountaineering and adventure sports with huge numbers of visitors enjoying the mountains in the winter and summer seasons. These days we see 20,000 people reach the summit each year, mostly up the ‘Goûter’ route, often completing the dream of a lifetime. But people do die on Mont Blanc every year - reaching the summit is far from an easy undertaking. This article on Wikipedia takes a more detailed look at the mountain’s history. The weather plays a significant part in any trip to Mont Blanc, and on a bad day, you won’t be able to see anything at all (known as a white out). The seasons are still reasonably distinct in Chamonix and ascents up the mountain generally take place in the summer months. Increasing temperatures recently have caused dangerous levels of rockfall on the main route up Mont Blanc which has led to closures on occasion when conditions have been extreme. Mountain weather is inherently changeable so make sure that you are always well equipped for the worst possible conditions. Weather on one side of Mont Blanc is often different to the other so whilst things may look grey in France, people may be enjoying clear sunny slopes in Italy. The local Chamonix Meteo forecast is the best that is available for Mont Blanc and further information can be found below. Mont Blanc is without doubt one of the most famous and certainly the most well known mountains in Europe. As a result its profile has been widely photographed by climbers, skiers and drones as well as numerous helicopters and aeroplanes. Perhaps even more amazing though is the In2white panorama, which enables you to zoom in and out of Mont Blanc, and gives fantastic detail of every feature. It is currently the largest digital photograph in the world and without doubt the deepest and most detailed picture you’ll find of Mont Blanc. The Instagram tag Mont Blanc is also worth having a look at and Flickr has some great public images as does Pinterest. It’s even possible to virtually climb Mont Blanc using Google’s streetview system more info here from the Guardian. Excellent documentary of a guided ascent of Mont Blanc via the Gouter route as well as some history. More Rockfall in Grande Couloir! Although officially illegal in France, Heli Skiing is legal in Italy, which borders Mont Blanc, so in theory you could get dropped near the summit and make like James Bond. Those proficient in cross country skiing do ski up the Grand Mulets route shown above and then down the Plan d’Aiguille to Chamonix. 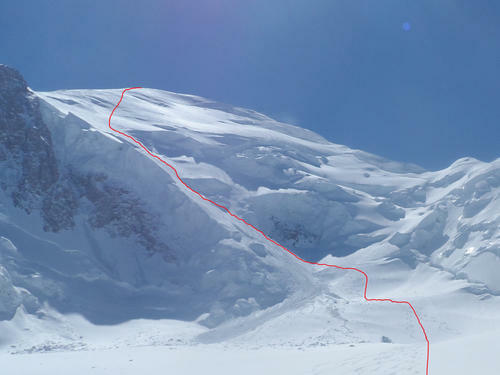 This route is considered dangerous bercause of the possibility of seracs falling off so you may prefer to investigate the Goûter ridge as an alternative way up. This company offers drop offs near the summit of Mont Blanc from 457€ per person, depending on group size. The whole experience takes place over two days. Heliski Courmayeur offers guided drop offs on Mont Blanc from 425€ per person all inclusive. There are also ski guiding companies who can take you on a guided ascent (then descent) of Mont Blanc. For example this company offers a trip that takes seven days to complete the objective. With a guided trip, you must ensure that your level of fitness is good enough to travel in the high mountains and you should also be competent in the use of ice axe and crampons. If you are not then you should consider doing an alpine course first. If your off piste skiing is not up to scratch then you may also need to brush them up with off piste skiing lessons. 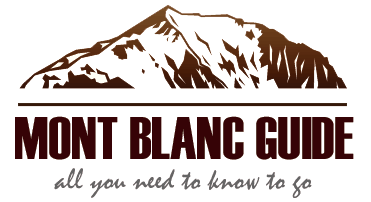 There is also some great info on skiing Mont Blanc in this excellent article from the British Mountaineering Guides. Site offering drops from 310€ per person. 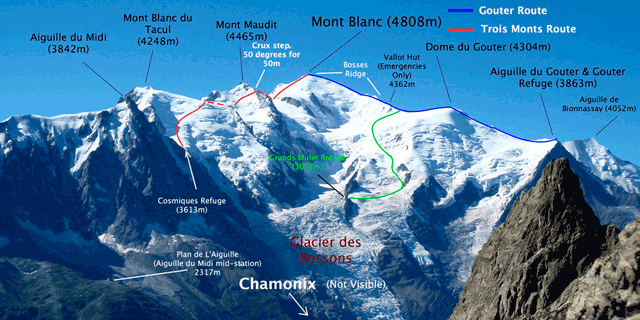 http://www.chamonix-guides.eu/... Ski Mont Blanc with a guide. http://www.icicle-mountaineeri... Ski Ascent of Mont blanc with guide. 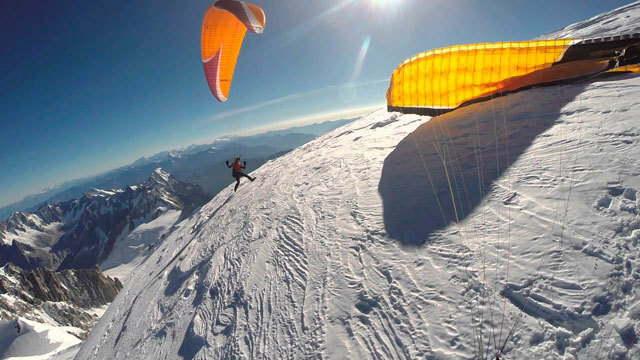 It is possible to fly from the top of Mont Blanc if you are an experienced pilot. Or perhaps if you’re lucky you can find somebody who will take you on a tandem flight from the summit, having climbed there first. Either way, this will be the flight of a lifetime. 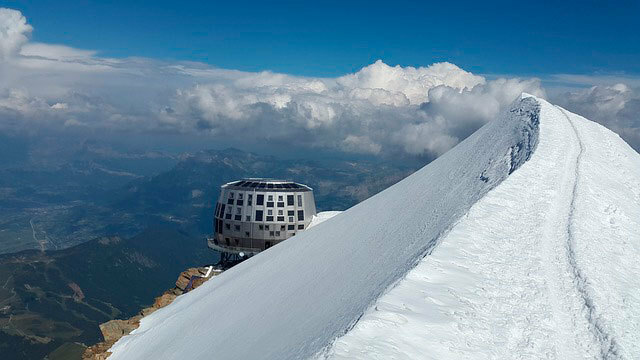 The usual way is by going up the Aiguille du Midi cable car and to ascend from there to the Cosmiques Hut before going for the summit the next day. It is also possible to land on Mont Blanc as you can see in this film when a very large group of parapenters all landed on the summit in 2012. Chamonix.net guide to paragliding on Mont Blanc. For those intrepid enough to want to climb Mont Blanc the usual way up is known as the Goûter route and involves some quite exposed scrambling (normally done in the dark) as well as exposure to falling rocks in the Grande Couloir and a host of other mountaineering dangers. The various routes up and down are set out in this page from UKClimbing. This article deals very well with the ‘how hard is it?’ question. If you are not sure that the climb is really your thing then you may alsowant to read this. Although there is no very technical climbing, this is not a route for beginners and even if you decide to hire a guide to pull you up it you’ll need to have a high standard of physical fitness to make it to the top. Thousands of people attempt the summit each year and not all make it to the top. Avalanches do occur, often with fatal results. This official guide from Chamonix.com includes some further information on dangers as well as phone numbers for mountain refuges and other useful details. This course offers the opportunity to climb Mont Blanc with a guide in 6 days. It includes everything you need and you’ll be taken on a warm up peak before going for the main objective of Mont Blanc. 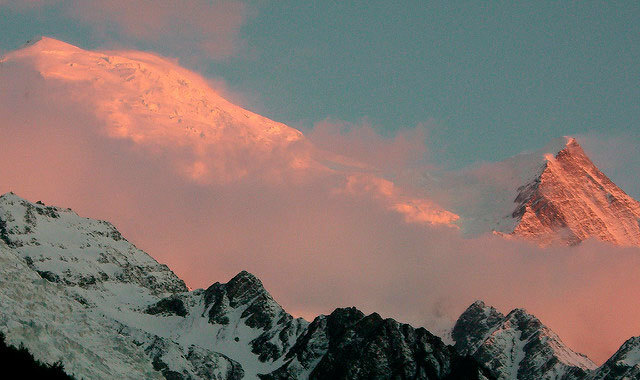 World Expeditions offer an eight day course with two summit attempts. Icicle mountaineering offer 6 days guided ascents throughout the summer. Climbing Mont Blanc is not like popping up Snowdon on a summers day – it normally takes several days and because of this you’ll need to book a night in the Goûter Refuge, which should be done well in advance. Although on Mont Blanc there will be plenty of tracks and groups of people making it very difficult to get lost you should still carry a good map. Do not rely on your mobile phone for this important task. Apps can be a nice addition but should not be your only reference. FATMAP is an in-depth hyper detailed mapping app for mountains. 'Iphigenie’ is an excellent mapping app with detailed maps showing paths and other information. Available for iPhone or Android.